How Does a Two-Stage Furnace Heat My Home? Which Furnace Should You Get? A furnace heating unit is a device used to heat air for residential homes and commercial buildings. It is one of the oldest types of heating systems still in use today. Older versions were powered by coal and wood versus today’s modern versions, which burn natural gas, propane and electricity to produce heat. There are several types of furnaces — single stage, two-stage and variable speed — on the market today with each having specific characteristics, costs and efficiency ratings. So how does a furnace work and how do you chose the best one for your home? Several factors are needed to determine which furnace system is right for your home such as average temperature, costs, the top furnace brands, square footage and insulation values. The following article will focus on how a natural gas, two-stage forced air system works and the benefits of installing one in your home versus a single stage furnace. 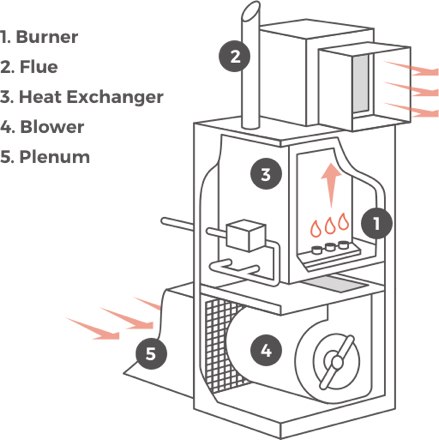 To explain how a two-stage furnace works, we will use a single stage furnace for comparison. A single stage furnace means that the valve supplying the burner with gas only has two settings during operation, on full blast and off. Once the valve is opened, gas travels to the burner where it is ignited by the pilot light. The burner heats the heat exchanger, which in turn heats the air for your home. A blower assembly including the fan and motor is used for air circulation. It pushes the heated air through the ductwork and out of the vents to provide the necessary heat. It also produces the required suction to draw fresh air through the furnace filter and back into the system for reheating. Two-stage furnaces utilize a three-position valve that is much more efficient than its single stage counterpart. The valve settings are on, partially closed, and closed giving the two-stage furnace greater control during operation as it can run on low, or automatically shift to high as needed. In the low position, the heat produced by the furnace reduces to around 60 to 65 percent. This allows the furnace to heat your home more evenly and efficiently during initial activation. As we all know, efficient operation means less energy use and costs. It all depends on the weather outside. During moderately cold weather, the furnace might activate in the partially opened position. The furnace’s control board and thermostat are responsible for controlling valve position. After reaching the programmed temperature settings on the thermostat, the furnace shuts down. On extremely cold days, when extra heat is needed, the valve opens fully, and runs full blast until the desired temperature is achieved. A two-stage furnace system adjusts its output and fuel use to meet the temperature demands of your home whereas a single stage system does not. The most obvious benefit of a two-stage furnace is that it burns less fuel, you will realize lower energy costs during the heating season. The system achieves this by minimizing energy use during milder weather, burning about 60 percent of fuel, and switching to high only when necessary during the coldest days of the season. A two-stage furnace also helps to eliminate cold spots and provides more even heating throughout your home. To explain this, we will again refer back to a single stage furnace for comparison. There are three reasons your home experiences certain cold spots, and no, we are not talking anything paranormal. The first is an oversized furnace. An oversized furnace can cycle on and off because it heats your house so quickly, allowing inside temperatures to cool before they are adequately distributed. The second reason could be a result of improperly installed or positioned ductwork. The final cause would point to a single stage furnace. Just like the oversized unit mentioned above, because a single stage furnace runs only at full blast, it heats your house rapidly and then turns off. The inside temperature can cool before the heated air is adequately distributed leading to uneven heating. A two-stage furnace can also increase the air quality inside of your home. Because this system runs more frequently than a single stage version, the air in your home is circulated more often. Therefore, air quality is subjected to more filtration leading to healthier air quality. 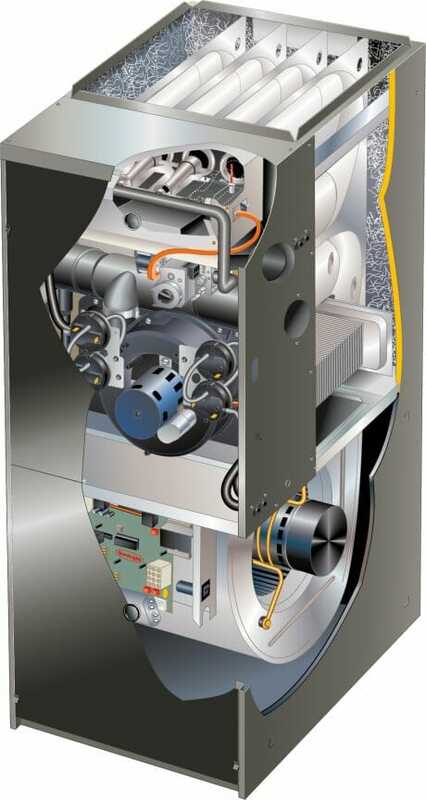 A two-stage furnace is well worth the additional costs over a single stage system. You must determine, based on your needs whether it is suited for you and your budget. A professional HVAC contractor can help you with this decision by performing a thorough inspection and evaluation of your home. They can also point out any deficiencies around your home such as inadequate insulation, potential air leaks around windows, doors and exterior doors as well as necessary upgrades to improve your home’s heating and cooling efficiency. With this HVAC guide you should now know how a furnace works and how to find the best heating unit for your home.